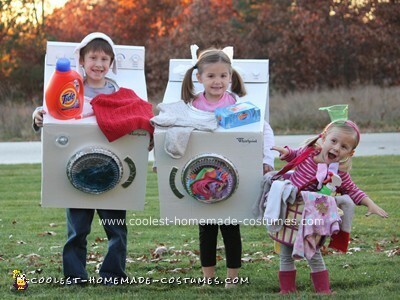 After browsing photos online, our kids passed up the opportunity to be candy and popcorn and instead chose to be appliances and dirty laundry, lol! Our oldest was the washing machine, complete with a door that opens (made from a deli tray), ‘bubbles & soap’ (blue cellophane and bubble wrap), plumbing attachments in back, and a REAL water feature (a squirtgun suspended inside that sprays through the ‘soap dispenser’ made from a Frosty top). Our middle child was the dryer. 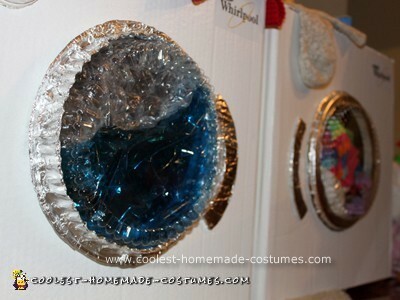 It features a barrel door (again, made from a deli tray) filled with clothes that spin and dryer sheet hair ties! Both the washer and dryer are topped with soap, dryer sheets and misc clothing, have labeled control panels with knobs (made from orange juice, milk and pop bottle caps), as well as electrical plugs in the back. Our ‘baby’ was the dirty laundry basket, full of laundry, clothespins, and stain spray, complete with a detergent cup headband. 1. Found an old box, cut it in half and painted it – proceeded to measure and cut out holes once dry. 2. Gathered bottle caps and deli trays, cut and covered them in tinfoil – added knobs and laundry tubs to machines. Designed, printed and added stickers, etc to the control panel. 3. Velcroed or glued on accessories such as detergent bottles, plugs, plumbing, and added clothing, bubble wrap bubbles and cellophane soap to tubs. 4. Cut a hole in a laundry basket. Added sock suspenders, clothing, and old stain remover & dryer sheet containers. Slit the bottom of a detergent cup and added it to a headband. The costumes are adorable, and so are your children! Thank you, thank you, thank you. I hate paying so much money for store bought costumes, the quality is so cheap). I love these costumes. They’re original and incredibly cute. 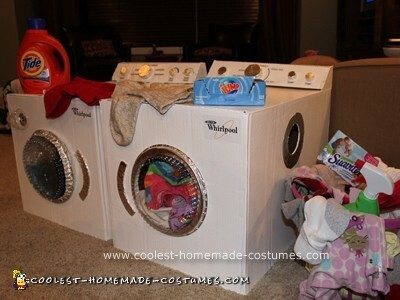 Your Washer and Dryer and Basket costumes were great. Can’t wait to show my grandchildren. Those are most creative, well-made, prize-worthy costumes I’ve ever seen in my LIFE!! The smiles on those beautiful faces are just priceless!! Job well done!!! Back in the late 70’s, my husband and I attended a Halloween Costume Contest Party sponsored by a local radio station. We went dressed as a washer (husband) and basket of dirty clothes (myself). We must have appealed to the judges, because we came in first place and won a trip to Europe. Best.Homemade.Costume.Ever! 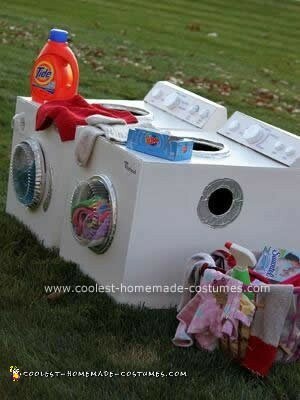 How did you make the back of the washer? Hey! Where did you find the stickers? WOW!!! I am in the process of making this for my 8 year old. Your picture inspired me to make it. LOVE IT!! !